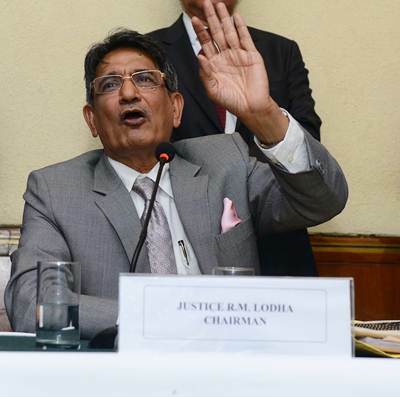 The Supreme Court is likely to pass direction, on Monday, over Justice Lodha committee plea alleging that the Board of Control for Cricket in India (BCCI) is violating the apex court order and committee directions regarding the BCCI reforms. - BCCI vs Lodha: Who will blink first? The apex court had on October 7 postponed its hearing on the spat between the BCCI and Lodha Committee to October 17, while holding that the recommendations of the panel matter. The top court also barred the BCCI from releasing any funds to its state affiliates until they give an unconditional undertaking that they will comply with the organisational reforms as recommended by the Justice RM Lodha Committee. Pronouncing the order, the Supreme Court had said that the state associations would not get funds unless a resolution is passed to implement Justice Lodha committee reforms. Thakur made contact with the governing body of the sport with regards to the inclusion of a Comptroller & Auditor General (CAG) member in the newly-formed apex council of BCCI. According to ICC regulations, national boards must not have government interference in its administrative body. A transgression in this regard could lead to de-recognition of member boards. During its October 6 hearing, the three-member judge had dismissed BCCI's response to the status report filed by the Lodha committee following the board's failure to meet an important deadline, with respect to the implementation of a Memorandum of Associations (MoA), as necessitated by the timelines framed by the Lodha committee. Justice T S Thakur had criticised the BCCI for transferring Rs. 400 crore overnight to its state associations which was against the Lodha panel's recommendations. The top court had also maintained that the BCCI should have exercised transparency in funding state associations saying, "You can't transfer Rs 400 crore overnight." Meanwhile, the BCCI, in its response to the court, had refuted allegations of non-compliance with the Lodha-led panel's recommendations, saying that "records of 40 mails" exchanged with Justice Lodha would be submitted before the apex court. "Records of 40 mails sent to Justice Lodha will be submitted to the court, not true that we didn't respond to Committee's mails," the BCCI had said. In its report, the apex court-appointed panel had stated that the BCCI was not implementing its recommendations aimed at reforming the country's cricket governing body. BCCI vs Lodha: Who will blink first?